Astronomers have found distinct spiral arms in the disk of gas and dust surrounding the young star Elias 2-27. While similar features have been observed on the surfaces of such disks before, this is the first time they have been identified within the disk, where planet formation takes place. Structures such as these could either indicate the presence of a newly formed planet, or else create the necessary conditions for a planet to form. As such, the results are a crucial step towards a better understanding how planetary systems like our Solar system came into being. The results have been published in the journal Science. Thermal dust emission from the protoplanetary disk surrounding the young star Elias 2-27 clearly shows a spiral structure. An international team of astronomers has obtained the first image of a spiral structure seen in thermal dust emission coming from a protoplanetary disk, the potential birthplace of a new Solar System. Such structures are thought to play a key role in allowing planets to form around young stars. The researchers used the international observatory ALMA to image the disk around the young star Elias 2-27, in the constellation Ophiuchus, at a distance of about 450 light-years from Earth. The group is led by Laura Pérez, an Alexander von Humboldt Research Fellow from the Max Planck Institute for Radio Astronomy in Bonn, and includes Hendrik Linz and Thomas Henning from the Max Planck Institute for Astronomy in Heidelberg. Planets are formed in disks of gas and dust around newborn stars. But while this general concept goes way back, astronomers have only recently gained the ability to observe such disks directly. One early example is the discovery of disk silhouettes in front of extended emission in the Orion Nebula by the Hubble Space Telescope in the 1990s, the so-called proplyds. The ability to observe not only each disk as a whole, but also its sub-structure, is more recent still. 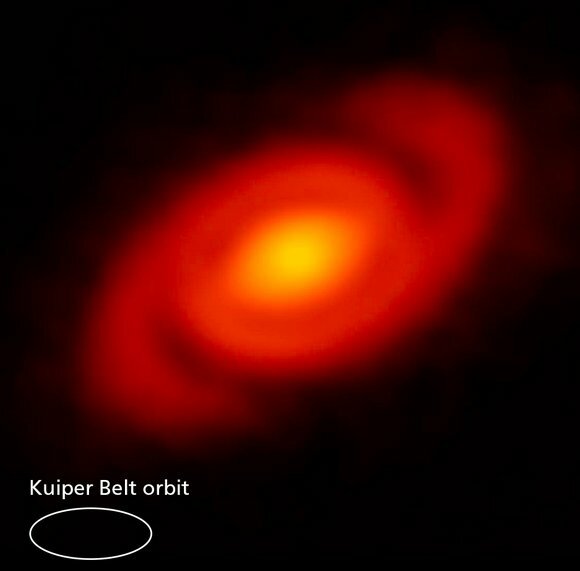 Gaps in a protoplanetary disks, in the form of concentric rings, were first observed with ALMA in 2014. These new observations are of particular interest to anyone interested in the formation of planets. Without structures such as this giant spiral, planets might not been able to form in the first place! The reason is as follows: In a smooth disk, planets can only grow step by step. Dust particles within the gas of the disk occasionally collide and clump together, and by successive collisions, ever larger particles, grains, and eventually solid bodies form. But as soon as such bodies reach a size of about one meter, drag by the surrounding gas of the disk will make them migrate inwards, towards the star, on a time scale of 1000 years or shorter. The time needed for such bodies to collect sufficient mass by successive collisions, eventually reaching a size where gas drag becomes a negligible influence, is much larger than that. So how can bodies larger than about a meter form in the first place? Without a good explanation, we could not understand how planetary systems, including our own solar system, came into being in the first place. There are several possible mechanisms that would allow primordial rocks to grow larger more quickly, until they finally reach a size were mutual gravitational attraction forms them into full-size planets. “The observed spirals in Elias 2-27 are the first direct evidence for the shocks of spiral density waves in a protoplanetary disk”, says Laura M. Pérez from MPIfR, the leading author of the paper. “They show that density instabilities are possible within the disk, which can eventually lead to strong disk inhomogeneities and further planet formation.” Such instabilities are not confined to the scale of planet formation. In fact, the best-known example are density waves in disk galaxies, which create the spectacular spiral arms of spiral galaxies. In regions of increased density, as those corresponding to the observed density waves, planet formation could proceed much faster, both due to those region’s gravity and due to the more confined space, which would make collisions of grains or rocks more probable. In this way, the problem of how to go beyond meter or ten-meter size objects could be solved. On the other hand, planets that have already started forming within a disk can launch spiral waves in the disk as they orbit their host stars. Distinguishing those two roles of spiral and other features — consequences of planet formation, or the cause of it? — will require a deeper understanding of such features, which in turn requires high-resolution images that show details of these structures. The young star Elias 2-27 targeted by the new ALMA observations is a member of a much larger star-forming region known as the ρ-Ophiuchus star-forming complex. Elias 2-27 is estimated to have formed about a million years ago; a very short time, compared to the age of our Sun of 4.6 billion years. The star was already known to have a circumstellar disk, but judging by previous observations (at resolutions showing details in the range of 0.6″-1.1″) this appeared to bea featureless, axisymmetric disk. The new ALMA observations with a spatial resolution of 0.24” were made in the millimeter wave regime, at a wavelength of 1.3 millimeters. They trace the thermal emission from dust grains, which may make up between 1 and 10% (by mass) of protoplanetary disks. In this way, astronomers were able to trace a gigantic spiral pattern at distances between about 100 astronomical units (that is, 100 times the average distance of the Sun from the Earth) and 300 astronomical units away from the central star. The interaction with a planet that has already formed and is now orbiting within the disk is one plausible explanation for these spiral features. ALMA detected a narrow band in the disk with significantly less dust, but such a small gap is not consistent with the large planet needed to create the observed spiral arms. On the other hand, the disk’s own gravity causes instabilities which can trigger the formation of the spiral pattern. Taking into account estimates for the total mass of the disk, and the shape and symmetry of the spiral pattern, the authors consider this possibility as also likely. As similar observations with ALMA become increasingly common, and more and more detailed images showing inhomogeneous structures in disk density become available, astronomers should be able to investigate the properties of such features, to eventually define their role in the planetary formation process. Web Source: Max Planck Institute for Astronomy.